Fully automated and networked production lines offer maximum prefabrication during production. The production lines are set up so that they can be put to a variety of uses and expanded using modules, making them a future-proof solution. The entire process is fully automated — from feeding in the unprocessed parts to loading the finished elements. By using robots, the entire material handling procedure can be automated and the individual processes simplified. 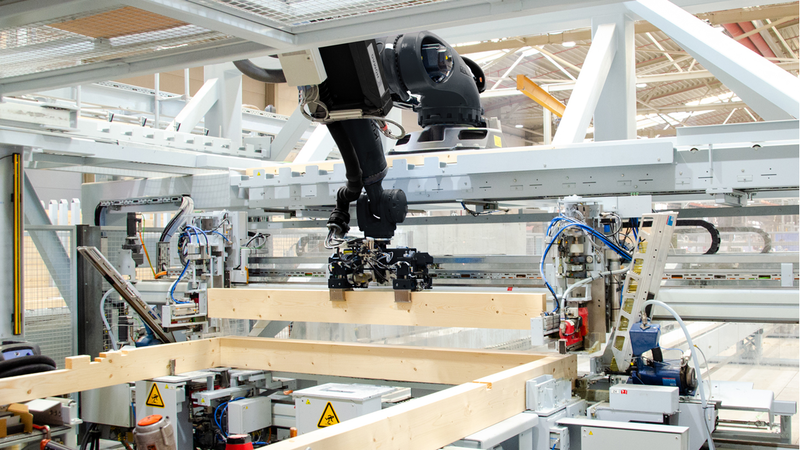 The robot grips heavy components and places them in the designated position, taking control of the entire beam installation process for making frame works, for example. The panel positioning process is also optimized by using robots.